The official Mod Programme will be available soon. Keep an eye on the website or on our facebook page to find out when they are here! The Kennedy Gillies Trophy will be up for grabs in a new ceilidh singing competition at this year’s Royal National Mòd in Paisley. 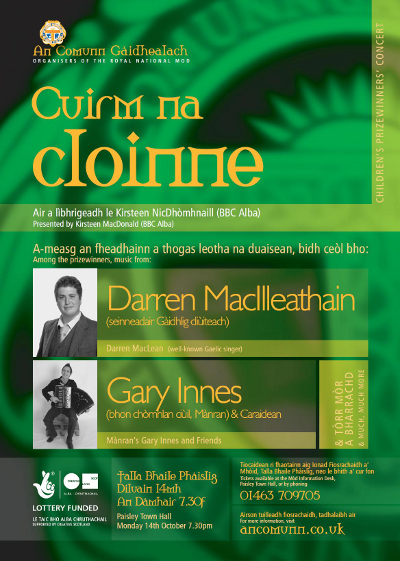 The competition will take place in “Hamishes Hoose” in Paisley during Mòd week. The winner will receive the coveted Kennedy Gillies Trophy which was kindly donated by the family of Calum Kennedy and Anne Gillies. There’s still time to get your entry in and compete in this informal competition. However, if you don’t fancy taking part, make sure and come along to enjoy the entertainment! 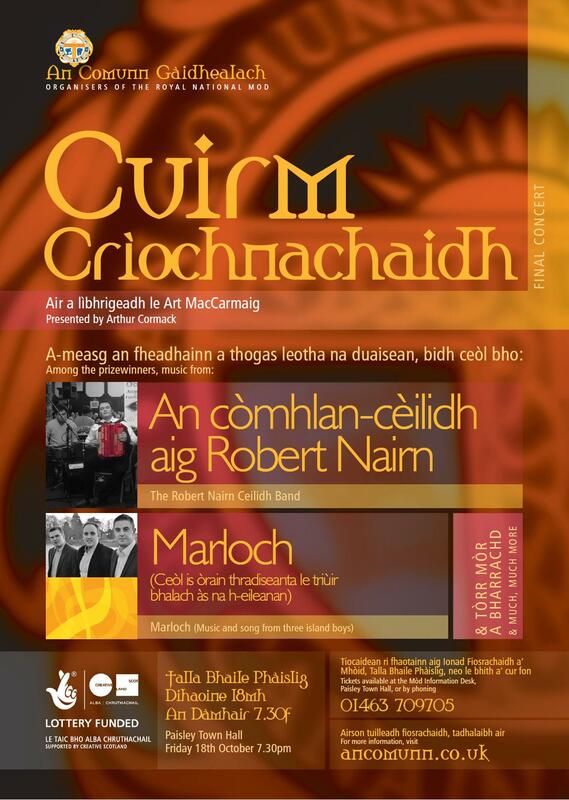 This competition will be held in Hamishes Hoose Bar in Paisley throughout Mòd week 2013. Qualifying rounds will be held on the evenings of Saturday 12th, Monday 14th, Tuesday 15th, Wednesday 16th and Thursday 17th October. Entry to this competition is free. There will be a maximum of six competitors in each qualifying round and the winner of each qualifying round plus the best runner-up will go through to the grand final on the evening of Friday the 18th of October. Each singer will perform a set of between 6 and 8 minutes in length. Each set must contain a minimum of three songs, and each song must have a minimum of two verses. All songs must be in Gaelic. Performers do not need to submit music or words to the adjudicators. 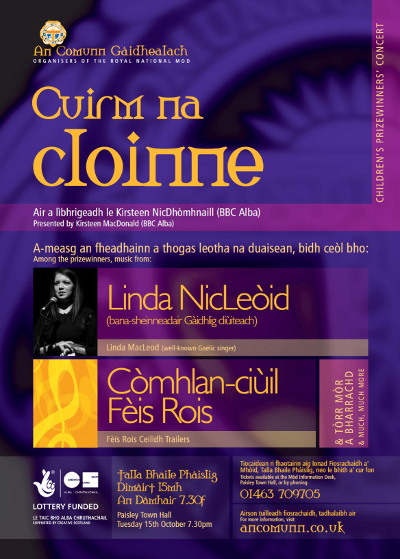 Links between songs should be predominantly in Gaelic. Songs can be accompanied or unaccompanied. A pianist and an accordionist will be provided. Other accompaniment may be used but this must be played by the singer him/herself. A panel of judges will judge the competition and will award scores out of 10. The audience will vote for their favourite and their votes will be added to the scores given by the panel of judges. 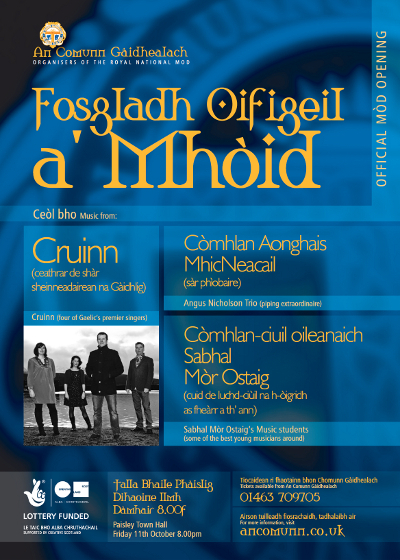 If you are interested, applications can still besubmitted to: CeilidhSinging.Comp@hotmail.co.uk, or by contacting An Comunn Gàidhealach: info@ancomunn.co.uk or by telephone: 01463 709705. Entries must include: Your name and contact details, either an e-mail address or a full postal address or a mobile number . Please indicate if you are not available for one or more of the qualifying dates (NB - your non-availability on certain nights may affect your chances of being included in the competition). After the closing date a draw will be made and the contestants will be allocated a specific qualifying round. Just to let you know, the Mod Programme will be available in the next couple of weeks - we will put a note up on here to let you know when it arrives. Get in touch if you’d like to order a copy. Do you still have trophies to return to us? PLEASE return these to us immediately - give us a call (01851 703 487) to let us know that you are arranging for them to be returned to us. If you are having difficulties in returning to them please let us know. They CANNOT be kept until Mod week. Trophies should have been returned by July 31st! Please ensure that trophies are engraved and polished. Would you like to steward or volunteer at Mòd Phàislig? We are having a stewards training and information session on Saturday 7 September at 2pm in the Wynd Centre, Paisley. Below you will find a ticket order form for the 2013 Mod in Paisley and a flier with some of the stock on sale in the An Comunn Shop. Should you wish to place an order, please return the forms to us and we’ll process your order as soon as possible. Should you require any further information, please get in touch.